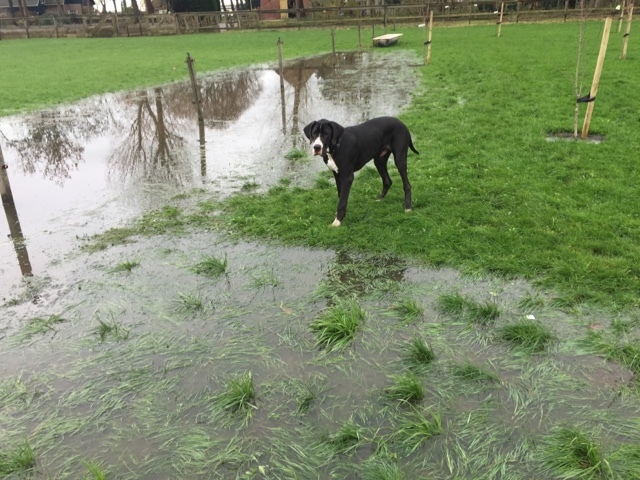 One of the facts of life when you live in the Netherlands is that unless you are lucky, you live below sea level. When 2/3rds of the country is recovered from the sea, it's kind of a given. Where we are, the land started to be recovered in the 17th century with windmills lifting water from polder to polder - so it has matured and grown a broad eco-system. In some of the areas around the Ijsselmere, which were recovered as late as the 1980s, the plant variety is still surprisingly low and there is a real dearth of mature trees. The water has been removed, but it still has to be continuously cleared out and the Dutch have built the most comprehensive system of interconnected ditches and dykes you have ever seen. As a land owner whose land abutts a drainage ditch, by law I have to have it dredged and cleared every year unless I build solid shoring along the edges of the land. It's been raining. Quite a lot, in fact. 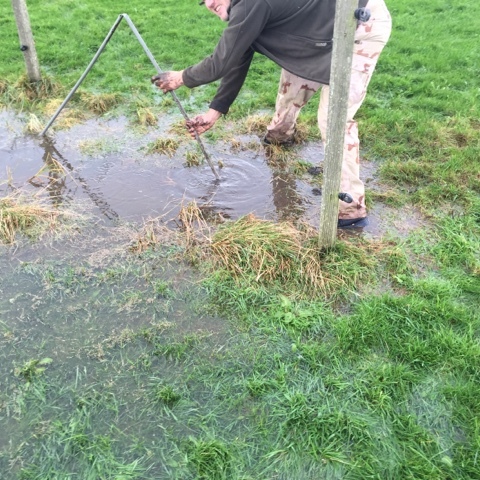 Yesterday, the riding ring had standing water in the sand - this morning we woke to flooded fields . With a set of cold frosty nights approaching the last thing I wanted was the newly planted fruit trees to be sat in a pool of icy water and have frostbitten roots. I want that orchard, and it needs roots to be able to grow! As so often in this house, an emergency task rises to the top of the list and everything else has to go on the back burner until the situation is resolved. 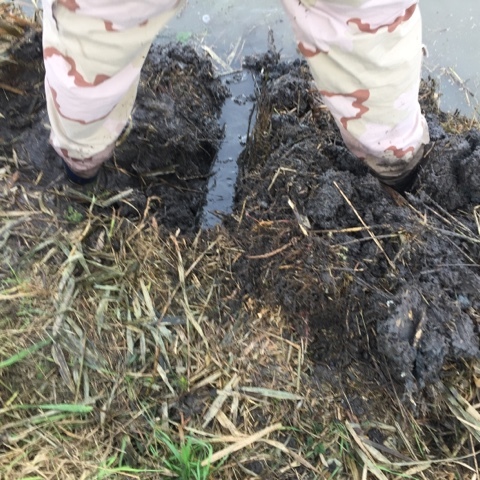 We pulled on our yard boots, prayed they were waterproof enough and headed out to the fields with poles, a drain cleaner, and a spade. Between the two fields there is a deep ditch, which seemed to have been deliberately dug, so our assumption was that there should be a drainage pipe buried in there. After much paddling and digging around with frozen hands in ice cold water, turned out to be correct as an assumption. 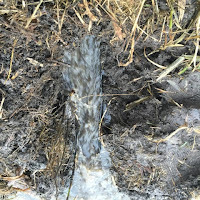 We headed down to the edge of the field to see if we could see an outlet : no visible pipe. What we could see were bits of broken plastic pipe, spread along the bank along with this autumns dredgings. W to the rescue - initially digging out where we think the pipe should be until we found the shattered and collapsed remains of it. We plugged away for about 40 minutes with absolutely no joy - it really wasn't shifting. The Dutch gods of the waterways were not happy and not willing to help out until W provided a blood sacrifice to satiate them. 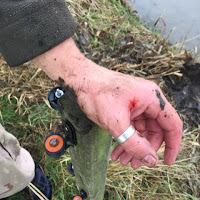 The pole that he was jamming into the top end of the pipe snapped and sharded, cutting his hand deep into the webbing between finger and thumb. 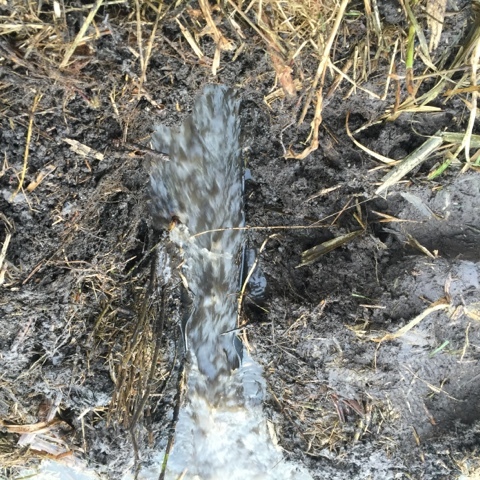 I was down at the ditch end, and as he cursed and jumped around the field making pained noises, I heard the wonderful sound of rushing water as it came tumbling through the pipe . The water's draining away steadily - let's hope that by tomorrow morning my fruit trees have dry toes again. We will have to re-lay the pipes again - its pretty clear that the current pipes are pretty knackered and worn. Given the frost forecast, I want to leave that til the spring if we can! True! I think we have to make a few more, given some of the other challenges we are facing!